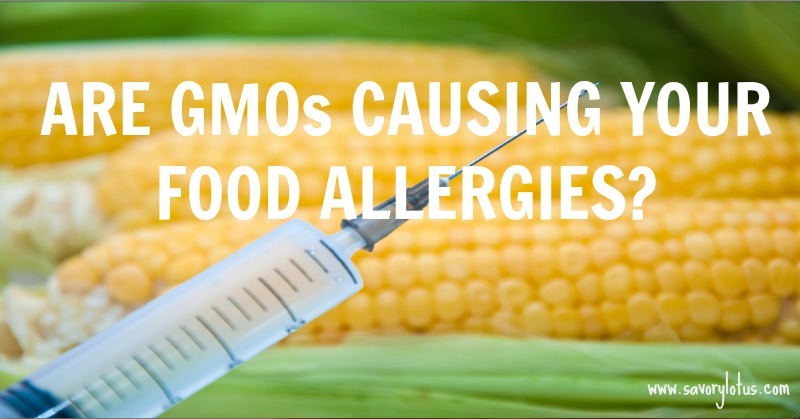 Are GMOs Causing Your Food Allergies? According to a study released in 2013 by the Centers for Disease Control and Prevention, food allergies among children 18 years of age and younger increased approximately 50% between 1997 and 2011. Food allergies affect 1 in every 13 children in the U.S. Researchers estimate that up to 15 million Americans suffer from food allergies. And it’s only getting worse. Every 3 minutes, a food allergy reaction sends someone to the emergency department. That adds up to more than 200,000 emergency department visits per year. The U.S. Centers for Disease Control reported that food allergies result in more than 300,000 ambulatory-care visits a year among children under the age of 18. And that doesn’t even take into consideration the thousands of folks who suffer digestive issues, asthma, skin disorders, chronic fatigue, and headaches related to food allergies. What the heck is going on? A food allergy reaction happens when your body reacts to a food protein as a foreign invader (just like a virus or bacteria) which triggers an inflammatory response. 90 percent of all reactions are caused by these 8 foods: milk, eggs, peanuts, tree nuts, soy, wheat, fish and shellfish. It’s important to note that even trace amounts of a food allergen can cause a reaction. A recent study showed the presence of Bt toxin, which is found in many GM crops, in human blood. Bt toxin makes crops toxic to pests, but manufacturers claim that the toxin is safe for the environment and for human consumption. The study found Bt toxin in 93 percent of maternal blood samples, 80 percent of fetal blood samples, and 69 percent of non-pregnant women blood samples. Researchers reviewed data from 19 studies and found that that consuming genetically modified (GM) food leads to significant organ disruptions in animals fed a genetically modified diet. Male kidneys were the most affected (45.5% of all changes), and female livers were a close second (with 30% of all changes.) Other organs affected were the heart and spleen, as well as blood cells. 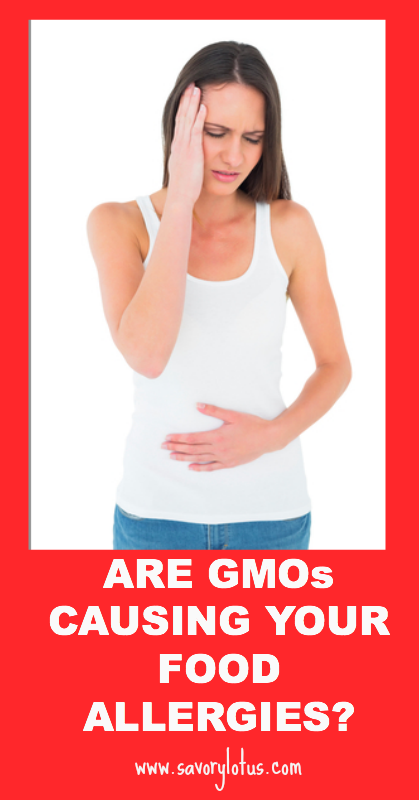 It’s no secret that GMOs have been found to cause health problems in animal studies. But what about the effect they are having on us human folk and our digestion? A study from the UK showed that soy allergies jumped 50% in the U.K. just after GM soy was introduced. The study identified irritable bowel syndrome, digestion problems, chronic fatigue, headaches, lethargy, and skin complaints, including acne and eczema, all related to soy consumption. The same study on soy found that mice fed GM soy showed dramatically reduced levels of pancreatic enzymes. When there is a reduction in protein-digesting enzymes, the actual foods stay in the digestive tract much longer, increasing the likelihood of an allergic reaction. This is an important fact considering that the reduction of these important digestive enzymes can now cause allergic reactions to a wide range of proteins, not just to the soy. Another study showed that GM soybeans contain an IgE-binding allergenic protein not found in nonGM soy. One of eight subjects who showed a skin-prick allergic reaction to GM soy had no reaction to nonGM soy. The evidence seems clear to me. Genetically modified foods were introduced quietly into our food supply without proper testing and research on possible dangers and side effects. The foods that we eat and how we assimilate them affects EVERY cell and function in our body. If we are consuming foods that are toxic and unhealthy, it will affect EVERY organ, function, and system in our body. We will continue to see the rise in chronic illnesses, digestive issues, and food allergies. My recommendation is to get back to clean, unprocessed ways of eating. Buy as much organic foods as you can afford. Stick with grass fed and pastured meats that are not fed GMO diets. Same goes for the dairy that you consume. And be especially mindful of the 10 Biggest GMO Offenders when purchasing produce. You are what you eat! Did you know that 99% of food allergies can be reversed? Yes, it’s true. You can heal your body and reverse your food allergies for good with diet. Do you have digestive issues, weight gain, skin problems, respiratory symptoms such as sneezing, wheezing, or mood disorders such as depression and anxiety, colic, or ADD/ADHD or autism. These are all signs of food allergies. For more tips to transitioning to a REAL food lifestyle see my REAL Foods Basics page. I got sick eating GMO corn in the mid-90s. Although I eat mostly organic, over the years I’ve eaten in restaurants (including tofu and corn). I am sensitive or allergic to the entire grass family (rice, oats, millet, corn, wheat, rye, spelt, sugar cane, etc. ), meat, fish, coconut, all seeds (sesame, pumpkin, sunflower), soy beans, almonds, citrus, cocoa, dairy, eggs, and more. I was born with connective tissue problems and am weak in that area. I know GMOs are toxic, but sadly, only recently learned GMOs in corn work by causing holes in the digestive system of insects, killing them. GMOs cause permeability, or leaky gut, so it makes sense allergies are rampant — the food particles get out and are attacked as invaders. I’m just very vulnerable to having my tissues torn apart. GMOs are actually viruses that work as pesticides and antibiotics, disguised as foods, that survive digestion and continue to affect your body and DNA after you stop eating it. I’m a canary, and what makes me sick is usually not healthy for others, they just usually dismiss it since their symptoms aren’t obvious. For 30 years, I tell people not to be around smoke, and then the surgeon general says “no safe amount of second-hand smoke.” I hope readers learn from this canary! Certified organic is the best option we have. Also, I’ve been to doctors plus 4 naturopaths over the years, when I had the resources. The closest we got to an understanding of my fatigue, foggy thinking, and multiple food allergies, was candida, leaky gut and a systemic fungal infection. It can be complicated when there’s more than one issue, so I didn’t understand it was probably caused by GMOs (my wheat allergy came first, in the late 1990s). I started a program of probiotics, but didn’t have the finances to continue. I felt better for a while, and believe that we can heal our gut! Great post! I’ve been making the switch to non-GMO/organic foods for a little bit now and I feel great! I had IBS, migraines, fibro symptoms, sinus issues and they’re all gone. My youngest son was uncontrollable when he was 5-6 years old, I’ve been changing his diet over the years and he is a different kid now at 14. This kind of info is hard for some folks to believe. We have to keep with it and be the example of healthy living. So awesome that you have made so many positive changes. Your family is lucky to have you. Yay for REAL food!